Recent updates on my website. The people living in what is now Northern Scotland in the Late Roman and early medieval period were known to their Latin-speaking neighbours (and, by extension, to us) as Picts. They spoke a distinct language, but little if any of it survives. A small number of Pictish inscriptions using the Irish script called ogham are known. What can these tell us about the lost language of the Picts? Elizabeth Chadwick s Marshal-Bigod family saga reaches the third generation, exploring family and social relationships in twelfth-century England through the marriage between Mahelt Marshal (daughter of William Marshal) and Hugh Bigod (son of Roger Bigod, Earl of Norfolk). Guallauc son of Lleenauc was an important king in late sixth-century Britain. He may have ruled the British kingdom of Elmet, and fought alongside his kinsman Urien of Rheged in Bernicia. What do we know about him? The spectacular Staffordshire Hoard, the largest collection of Anglo-Saxon precious metalwork ever found, was discovered in 2009 in the English Midlands. Better Than Gold, a childrenâ€™s novel set in seventh-century England, imagines events that could lie behind the hoard and its burial, told through the eyes of the ten-year-old prince Egfrid of Bernicia during his time as a hostage in an enemy kingdom. Ceretic was the last recorded king of the British kingdom of Elmet, and lived in the early seventh century. What do we know about him? Sympathetic portrait of Margaret of Anjou and her role in the Wars of the Roses in fourteenth-century England. The What's New panel is available as an RSS feed. | What is RSS ? Welcome to Carla Nayland's website. Here you can read about my novels Ingeld's Daughter and Paths of Exile, find out about the background to the novels, and contact me with your questions and comments. 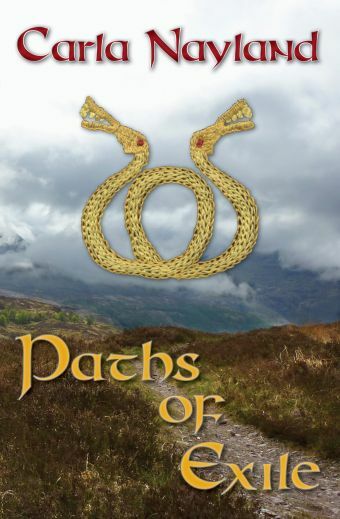 Paths of Exile is available from Wordery.com, Amazon.co.uk, Amazon.de, Amazon.ca and Amazon.com, and bookshops should also be able to order copies. It is also available from the Book Depository, and as an e-book from Amazon Kindle UK, Amazon Kindle US, and in several e-book formats including Kindle, Epub (Nook, Sony Reader) and Palm from Smashwords. Signed copies (limited stock) available direct from the author, contact me for details. BBC Radio Suffolk interview about Paths of Exile. You can also read my non-fiction articles on various aspects of history, lifestyle and culture. There is also a page of books I like, and a list of my book reviews. I shall be adding and updating content from time to time, so check back regularly. The most recent additions to the website appear in the What's New panel on this page, and you can also subscribe to our RSS feed. I also keep a blog, with regular postings about reading, writing and researching historical fiction, plus anything else that interests me. Carla Nayland writes historical fiction set in Britain in the period between the Roman occupation and the Norman Conquest (5th to 11th centuries AD), and fiction set in an invented world loosely based on medieval and Renaissance Britain. Carla Nayland has a lifelong interest in history and archaeology and considered doing a degree in the subject in her spare time, until deciding it would be much more fun to explore it in historical fiction instead. Historical fiction is more absorbing to write than a research paper, because it requires imagining a past society in all its detail, and requires the author to make choices and follow up the consequences. The result is also rather more enjoyable to read than a thesis. She has degrees in Natural Sciences and Pharmacology from Cambridge, UK, and has worked for many years in corporate strategy, cost-benefit analysis, health economics and scientific writing. Carla Nayland is also a keen hillwalker, which is a bit of a problem as she lives in the flatlands of East Anglia. She knows the M6 rather well. Carla Nayland is a pen name, to keep her fiction separate from her scientific writing. Copyright © 2006-2009 Carla Nayland.